Hi 2NJ! Hope you're having a good day! You too, Magnolia! You came in while I was posting! I had my Veteran home today. My thanks to all our Veterans! I'm glad you got to spend the day with your Veteran 2NJ! God bless yours, and all our Veterans. Tamikosmom said: "Think about it. Joran is holding the Ace. If he were to expose those behind the cover up in the Natalee Holloway case ... the Aruban/Dutch house of cards collapses." Bingo, Janet! Think about what this little twerp has done and how many have covered up for him. It's really a disgrace. I wonder what the cost of the F-16's were? I wonder what Joran Vandersloot and the Kalpoe's have cost Aruba in tourism? I hope and pray Mr. Flores gets justice and fights the corruption. For the sake of his daughter and Natalee, I am praying for truth and justice. It broke my heart to see Beth cry like that. I still have faith that someone will come forward that holds a key. Thank you Veterans as we remember you today! Goodnight Texasmom! Thanks for all you do here! I really appreciate you! Glad to hear that! Best to all Vets and their families, friends. Personally I suffer from CRS syndrome (Can't Remember ..you know what) so when ever I see repeated posts here from the present or the past it either helps me remember them or I scroll right past them if I know what they say. Everything here is important in our own way for the Justice for Natalee. It's so good to see you IBE. Flanders, in north-west Belgium, was the scene of one of the bloodiest battles of the World War I. One of the few things said to have survived the bloodshed was the poppy. Lieutenant-Colonel John McCrea, a Canadian doctor serving on the battlefield, wrote this poem after treating the battle wounded and burying the dead. She sits down across a coffee table from me. Behind her are two official-looking men. I start talking a hundred miles a minute, because I know my time with her is limited and I want to get it all in. I tell her about Natalee's case and about everything that went wrong from the first night we arrived on the island. How suspicious the events surrounding the investigation have been. I tell her what I've learned about money laundering in Aruba to support the North Korean nuclear-arms program and about the drugs there. She is very attentive. I continue talking very fast, seated on the edge of my chair, and conclude by asking for her assistance from the FBI. Real assistance. I ask her if there is anything she can do to get Aruba to let the Bureau help in Natalee's case. She speaks once. She turns to the two men behind her and says, "I want the FBI back on this." And that's all. I thank her, and I know how lucky I am to have had this private meeting with Secretary Rice and what a privilege it is. I pray that whatever happens in Natalee's favor as a result of this meeting will one day help others who may find themselves in our family's desperate predicament. AMSTERDAM -- The National Research in the deepest secrecy and a half year study of the family of then Minister Johan Remkes. 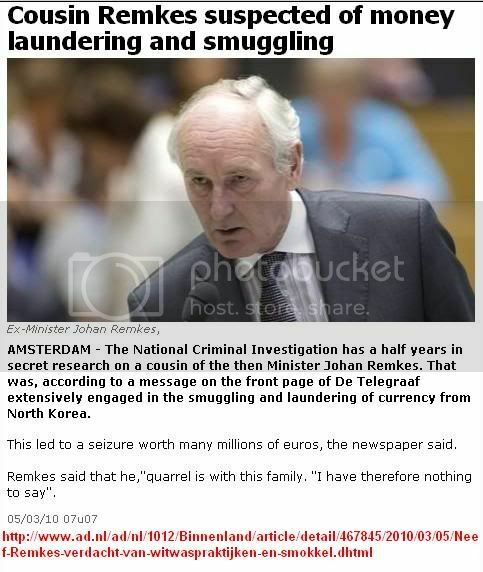 The same nephew of former Interior Minister was working on large-scale smuggling and money currency from North Korea. The study was conducted in silence and began almost two years before Remkes stepped down as minister. It has led during his ministerial duties until a seizure worth several million euros. The study was highly sensitive because it was family minister. The cousin was involved in the laundering of large sums of money from a so-called rogue state. North Korea was among the Americans' axis of evil ". The Telegraph reveals exclusive report this morning in a "top secret" investigation file of the national public prosecutor, which still must come to court. Thus, the nephew in the act committed by an observation team to a big money transaction. Former Minister Remkes showed yesterday that he "parted" with his eponymous family. "I have therefore nothing to say." He also says not to comment on whether he minister and head of the police and secret service AIVD informed about the investigation into his cousin. "I never talk about what I heard was a minister. The line I keep." The lawyer is the cousin of his client by Prosecutor offered a deal, so the North Korean currency smuggling not have to come to court. The British, Canadian poppy and the VFW poppies are constructed differently. Across the Nation each Department (state level) has the veterans in the hospitals make them by hand. They are paid for each one and in turn the poppies are sent to each American Legion Auxiliary Unit across the Nation (a required program for us). Our order for this coming May is 400. So in May we open each poppy by hand (I've opened hundreds and hundreds of them and can do it it in my sleep); have our poppy cans ready and pass out the poppies. We do not "sell" them but 99 % of the time get contributions back for them. You should see how the people's faces light up! Our American Legion Auxiliary Unit pays for the making of our ordered poppies, 10 % net to the Dept. to help Veteran's and net goes into the use of only our Unit's Veteran's programs and education, not into the general fund. It seems that in Flanders we had to leave our troops deceased in the trenches. When we came back to get them, the whole field was covered in poppies. At first home grown poppies were given out, then made of silk and now the ones on wire with supposedly 4 petals, center, white cover (glue covering) and banner. I remember them being a tradition in our family in Indiana as much as the Salvation Army kettles were at Christmas. It used to be that each Unit's named appeared in the banner. Now is says the ALA, the year and in memory. Some on eBay collect one for each year. I'd upload a picture of the poppy from our National site but don't know how to do it. OH The Flanders poppies are not to be confused with the other red ones, the Shirley poppies. I order my seeds on eBay. When our Juniors (we mentor our young lady members) did a fundraiser selling packets of seeds, I ordered in bulk from Texas and then we put them into 1x2 inch or so plastic zip lock bag. Sold them for a $1. Made money. The seeds are so small we used a teaspoon for each bag. oh hecky darn... just lost the connection. Hope this posts. Janet, Thanks. Boy are you quick. What do you use as your database? You and Klaas are neck and neck in the Fast Dept.! Thanks Texasmom. Am going to run over to the blinkoncrime.com site for a few minutes to get caught up and will be back. PS Brain injuries are really big in this war among the Vets, men and women, plus loss of limbs. Although I do now ... prior to your request I did not have ANYTHING backed up in regards to the North Korean issue. I used the SM search engine. Key Words: North Korea. Jen and texasmom's posts were revealed. IBE- great to see you! Sorry I missed you while you were here! Page created in 10.127 seconds with 19 queries.